On April 8, Russian mass media reported that prominent Russian author Grigory Chkhartishvili, writing under pseudonym of Boris Akunin, "was refused to enter Uzbekistan". According to Irina Bogat, the director of Zhaharov publishing house, where books of Akunin are published, the author of novel series, devoted to detective Fandorin, began working on new book and was planning to visit the republic to collect information. However, the authorities of Uzbekistan did not like the opinion of the author and he was not allowed entering the country. In the air of Echo Moskvy radio station Ms. Bogat mentioned that Uzbek officials were concerned that Boris Akunin will write something they would not want to see published. She underlined that now Boris Akunin is banned from giving a tourist visit to the country. According to Mr. Akunin himself the Embassy of Uzbekistan in Russia asked for the synopsis of the future novel to make sure the country is not given critical comments, Kultura radio station reports. Today, however, Uzbek Embassy denied this information. The press-service of Uzbek Embassy in Russia declared that Russians are not required to obtain visa to enter Uzbekistan and it is not correct to announce that Mr. Akunin "was prohibited to visit". According to RIA Novosti agency interviewer, unnamed employee of Uzbek embassy in Moscow, the person, willing to work with archives of Republic of Uzbekistan, must direct the application to Uzbek embassy, indicating the topic and the goal of research. 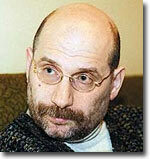 "There was no such application in the documents, signed by Mr. Akunin or organization, representing him. When a person cannot enter the country, where visa is required, and he had been denied to get a visa – this means that "he was banned". He simply needs to buy a ticket to enter Uzbekistan", the press-service of Uzbek embassy in Russia says. According to embassy employee, such application is given detailed consideration in Tashkent and the response comes quickly. "In the last two years there were only two applications and both were allowed", press-service indicates adding that "such considerations require no synopsis". Ferghana.Ru contacted Grigory Shalvovich Chkhartishvili with the purpose to hear his own version. This is what he shared with us. Grigory Chkhartishvili: That fact that no visa is required to enter Uzbekistan is true. The fact that we did not apply to the embassy is not true. We visited the embassy and met embassy employee. His last name, if I am not mistaken, is Kosimov. He also manages the Foundation of Uzbek culture and art. The meeting was quite official. The publisher also attended the meeting. Nothing was mentioned about required written application. I was promised total cooperation and support. When we faced problems the same employee asked to send him an email, listing what we need. I did that. The rest is just game of officials. If they do not want me to write a book, dedicated to Uzbekistan in the beginning of the century, I will not do that. I already decided that for myself. This is it. Ferghana.Ru: What were you going to write about? Grigory Chkhartishvili: I am interested in Great Prince Nikolai Konstantinovich that lived in Tashkent. I am interested in the circle of Bokharan Seyid Alim-khan and other things of that epoch. To be honest, I am not interested to make assumptions why this created suspicions. In my opinion, this is silly. Ferghana.Ru: Do you want to visit Uzbekistan as tourist? Grigory Chkhartishvili: No, I could look through pictures with same success. I need to see documents. I am interested in the correspondence of political agency in Bokhara with secretariat of Turkestan governor general. These things are filed in Tashkent. I am also interested in some other things. The writer Grigory Shalvovich Chkhartishvili was born on May 20, 1956 in Georgia. Since 1958 he has been living in Moscow. Mr. Chkhartishvili is the author of fictional novels. He has been nominated to many professional awards.